Kristy Nijenkamp and I spoke to the Southern Flames last week. The topic was “Finding Inspiration Anywhere.” Among many things, I addressed the importance of proportions of colors in a smashing color scheme. 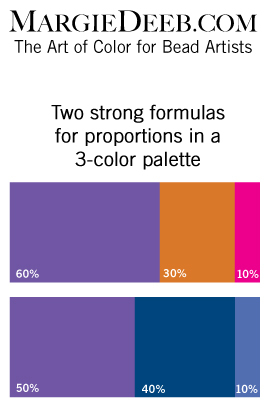 Here’s what I consider a good starting point for a 3-color palette. Often 2- and 3-color palettes make the strongest, most memorable schemes. Here are photos of Kristy and I presenting the colorful material.